OK, I will be honest. The moment I saw what this book was about I was worried about reading it. Jessie Rees dies of cancer at the age of 12. Sure, I will read that, no! But, I know she did a lot once she was diagnosed with cancer to help others. She came up with the idea for JoyJars, to give to all children fighting cancer. 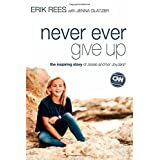 I know this book was written by her father, Erick Rees, a pastor at Saddleback Church in Orange County, California. So, I plunged ahead and finished the book in 1 day, ha, so much for being fearful. Yes, I cried, but I also smiled and was so inspired and touched. The book shows you how, in our modern times, social media can be used to help inspire someone who is fighting a terminal disease and be used as a starting point to inspire others. Disclosure: I was given this book by Handlebar Publishing, free of charge to review. All opinions are 100% mine.